Is the gig up for the gig economy? Micro-gigging via the various labor platforms in the sharing economy leaves already vulnerable workers no better off, and in some ways worse off. The pay is low, the safety net eviscerated, job security nonexistent. A graphic designer can make $300 in one day, but not have any more work lined up for two weeks and have trouble making rent. A public-relations consultant can count IBM as a client, but still have to choose between squirreling away some money for retirement and affording the smartphone she needs to track all her clients. A young college graduate goes freelance but can’t pay her crippling student loans. If you lose a gig and haven’t yet found another, tough luck, you aren’t even eligible for unemployment compensation; if your client pays a month late, or stiffs you entirely, tough luck again. And on top of it all, you get paid less than your regularly employed counterparts, on average 25% less in hourly wage (with the gap even larger for some occupations). But here’s where the share-the-crumbs economy becomes even more sinister, raising an ongoing labor tragedy into a profound existential crisis. In a regular, full-time job, a worker gets paid “on the clock” for an agreed-upon number of hours per day, week, month, year. Rest and bathroom breaks, staff meetings, time at the water cooler with fellow workers, all of those are paid time in a regular job. A certain amount of on-the-job downtime also is paid time—it is recognized that those moments sometimes give rise to wellsprings of creativity and innovation. On the whole, this has been a workplace structure that has been successful for American workers and employers alike. But the freelance society—the gig economy, the 1099 economy—is massively overturning this universal order. In the name of hyper (market) efficiency, suddenly the “extraneous” parts of a worker’s day are being eliminated. Micro-gigs with job brokerages like TaskRabbit and Elance-Upwork are reducing workers’ value to only those exact minutes someone is raking the leaves, or on the computer, or banging the nails or engaged in a specific task. The new digital platforms can chop up an array of traditional jobs into discrete tasks, and you will be paid only for those exact productive moments. All of it logged on your smartphone, and your performance constantly tracked, analyzed and subjected to review by employer as well as customer-satisfaction ratings. It’s as if New England Patriots quarterback Tom Brady only got paid when he threw a touchdown, or a chef got paid by the meal or a doctor for a surgery performed. It’s piecework, with no annual salaries, no payment for any preparation, or for training or research, and all the time and activities that led to that final product had to be done on the individual’s own time and dime. Arun Sundararajan, a professor at New York University’s business school, is the sharing economy’s favorite academic, trotted out on a regular basis to put a gloss of scholarly respectability over its increasingly questionable practices. He has endorsed Uber’s and Airbnb’s insistence that “self-policing” via the customer ratings system is sufficient regulation for their companies. He also speaks glowingly of the hyper-efficiency of the new gig economy. In fact, he gives it a rather sinister-sounding name—“monetizing your downtime.” These services “are tapping into people’s available time more efficiently,” he says. We may end up with a future in which some of the work force will “do a portfolio of things to generate an income—you could be an Uber driver, an Instacart shopper, an Airbnb host and a Taskrabbit,” he says. “Monetizing your downtime.” If that sounds like a glorious future, then an app called Spare5 is ready for your download. That app, writes Nick Wingfield in the New York Times, allows people to monetize “the brief interludes in most people’s day when they’re waiting for a latte at Starbucks, sitting in a waiting room or riding the bus home.” There is no need to relax anymore while you are waiting—what a waste of time!—now you can get paid to perform “nanogigs,” which are even smaller than microgigs. “It’s the next logical step in the sharing economy,” says Wingfield. One such nanogig is tagging photos for the Internet retailer Zulily, describing women’s shoes with words like “sandal” and “flats.” The rate of pay? About a buck thirty per hour. Or you can try your luck on Amazon’s service Mechanical Turk, spending chunks of her time labeling photo slideshows at a nickel each. Matt Bencke, the chief executive of Spare5, calls his company’s app an “on-demand work platform that breaks large, corporate, operational problems into tiny, bite-sized tasks.” It turns out that nanotasks such as providing accurate, detailed tags on photographs—what has been called “metadata”—are becoming increasingly used in e-commerce to help people find the right piece of apparel, a hotel room with the perfect view and more. So now you don’t have to waste your spare time, you can put it to work: Courtney Dale made about $53 per week by using the Spare5 app two to three hours a day. That rate of pay works out to—about three dollars per hour. But hey, it’s just spare time, right? Spare time is cheap. Who needs spare time? This “nanoization” of work into ever-smaller gigs is what the sharing and peer-to-peer visionaries are demanding of U.S. workers. They want to turn people into, not just micropreneurs, but nanopreneurs. It’s a warped, mad science coming out of Silicon Valley, the logical culmination of a tech-driven, sci-fi doctrine in which the primary allegiance is toward a hyper-efficient allocation of human beings, as if they are machines. Not even temp agencies have had the effrontery to do that. They usually pay a worker a set hourly wage for a specific amount of time, such as a half or full day or a week of labor, with paid rest breaks and lunch breaks, governed by regulations. But that’s too inefficient and humane for the new economy gurus. Morozov calls their sharing-economy creation “truly neo-liberalism on steroids,” because of the way it creates markets everywhere, and out of everything and everybody. That’s why the share-the-crumbs economy is more than a labor tragedy—it’s an existential challenge. 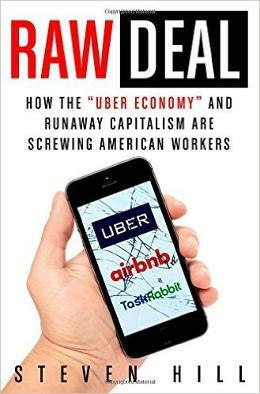 In short, the gurus of the sharing economy have been at the vanguard of an audacious attempt to forge an economic system in which individuals and businesses with “more money than time” are able to use faceless interactions via brokerage websites and apps to force an online bidding war among lower-income people to see who will charge the least for their labor, or to rent out their personal property (such as their car or home). If everyone is consigned to doing piecework, and no one knows when the next job will come, or how much it will pay, what kind of private lives can we have, and what kind of relationships or families?